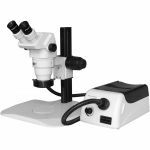 HEIScope SZ MP2 Series Stereo Zoom Microscope Packages includes a HEI-SZ-B2 (SZ301101) Stereo Zoom Binocular Body with .67-4.5x magnification range using HEI-EP-W10 10x Eyepieces, HEI-EP-EG Eye Guard Cups, and a 1.0x and 0.5x Auxiliary Lens. 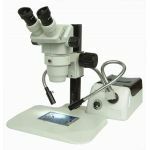 HEIScope SZ MP2 Series Stereo Zoom Microscope Packages comes with a Track Stand. 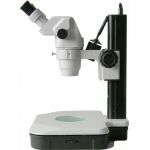 HEIScope SZ MP2 Series Stereo Zoom Microscope Packages allows you the choice the light source. You can choose No Light Source, Fiber Optic Illuminator with Annular Ring Light Guide, Fluorescent Ring Light, and LED Ring Light. 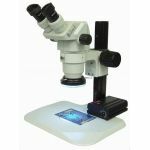 All HEIScope SZ MP2 Series Stereo Zoom Microscope Packages comes with a HEI-MS-CV ESD Safe Microscope Cover. 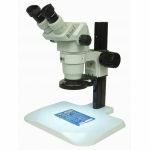 Purchase a SZ MP2 Series Stereo Zoom Microscope Package sold by Howard Electronics Today!